"I lived here about four years. I understand the logistics of homelessness. You are trying to find a bathroom, brushing your teeth, just those little things. I mean, YOU'RE ON A SIDEWALK! One thing that makes me happy is to find this person who would not have reached out to me, and I reached out to them, and turns out they needed help. I like to find those people." I remember when I first came to Los Angeles as a reporter for German public radio, my first assignment were the Oscars. I reported about diamond studded shoes on the red carpet, gift bags, glitz and glam, poolside junkets under palm trees. A few weeks later I was on Skid Row, homeless capital of Los Angeles. Wow! It was like enering a different universe! "You can fall in love with the desert which happened with me the first time I topped the rise of that hill. The view just goes on forever." 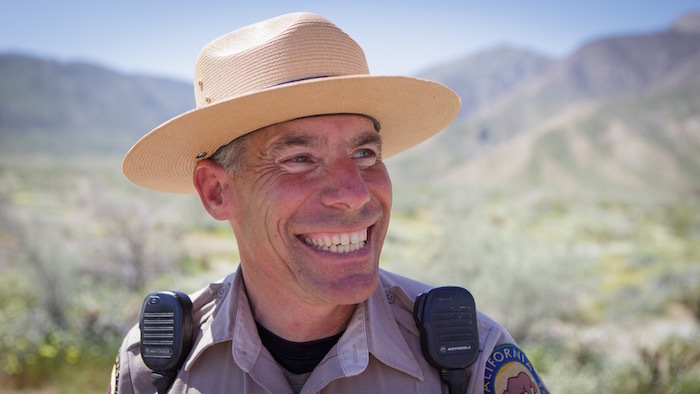 The first thing I saw was Steve Bier's wide, friendly smile under his big-rimmed ranger's hat. He stepped out of his truck, handing me a water bottle before shaking my hand. I had come to Borrego Springs to report about the record wildflower bloom for German public radio. I had not arranged for an interview with a ranger. Steve volunteered to give me the information I needed. I am sure thousands of tasks were waiting for him as visitors poured into Anza Borrego desert from all parts of the world. But Steve took his time, telling us the most wonderful stories about flowers, creatures, pollination and climate change while in between making sure an ambulance got to a stranded and dehydrated hiker in the nearby mountains. While my friend and photographer Dirk Rohrbach took pictures, Steve talked to me about his love for the desert and why a city guy like him ended up in a remote place like this. 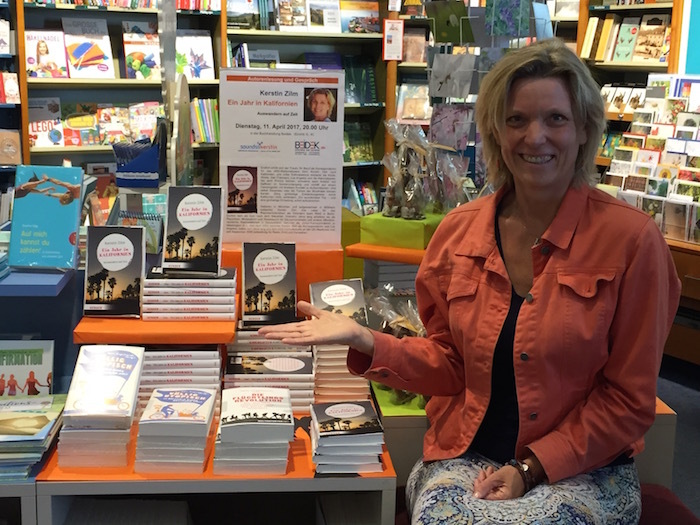 The local paper calls me a "writer and journalist, a woman from Müllheim who went into the wide world ... observing life in California." It is a funny feeling to be written about as a journalist. Hey, I am supposed to ask the questions! I am supposed to decide what makes it into a story and which details can be disregarded. But I have to admit: the journalist reviewing my reading in my former class mate's book store right in the heart of the small town where I grew up got it right. This insight comes as a surprise. If she is right, I am and do exactly what I wanted to be and do when I left Müllheim after graduating High School: go out into the world, explore, discover, observe and write about it. Looking into the familiar faces of family, friends and teachers from school while reading from my book about California and talking about my life, I feel at home. Not only the friendly faces are comforting. On my trip I recognize sounds and smells and views and tastes from childhood and youth. "The scary part is, hearing the door break and someone could come into my house and take me or my family away." "I told my Mom and my stepdad to go to Mexico with my little brother and I stay, because I can look out for myself pretty well." "That's what I always wanted to do: come to school and learn. And that somebody is now threatening for us to be sent back, that's the scary feeling." "You sit there, sleepy eyes and sour coffee breath." "Have you ever had someone tell you, you are ugly, you are not pretty? Lies." "Next door there will be a church and the face of The Joker will be outside the church to scare zombie and creeper away." "Blue nail polish is ignoring what other people think and staying true to yourself." For a while I have been feeling the urge to "do something" instead of just reporting about people who do something. Finally the urge became too strong and I started volunteering at two non profit organizations only a bike ride away from my home. 826LA encourages students age 6 to 18 to write. The Mar Vista Art Walk creates a space for artists and community to celebrate creativity, love and respect for each other and the planet.